Did you know that approximately 80% of pets have periodontal disease by age 3? Periodontal disease commonly affects adult dogs and cats, with far-reaching effects not only to their teeth and gums but also their overall health, including major organ systems. Fortunately, the problem can be treated, even prevented. Periodontal disease is inflammation or infection of the structures surrounding the teeth, namely the gums, periodontal ligaments, and bones of the gum line. Bacteria, food, and saliva in the mouth form plaque, which adheres to your pet’s teeth like a sticky film or coating. Plaque build-up mixes with the salt in saliva and hardens to create tartar in your pet’s mouth. Tartar leads the way to bacterial problems, periodontal disease, pain, and other oral health problems. Left untreated, periodontal disease will continue to progress and worsen. In the early stage, your pet may display symptoms of gingivitis, or bad breath, with little or no other noticeable signs of infection. At this point, it can be easy to overlook the problem, especially when many believe bad breath is common among pets, but early intervention is important to good health. Some pets can display signs of swollen and reddened gums, or even some pain, in the early stage of the condition. They are the patients most likely to receive treatment before the condition worsens. As periodontal disease progresses, the gums become more swollen, with noticeable inflammation and tenderness due to a moderate level of plaque formation. A larger area of the teeth and mouth will now be affected. The crowns of some teeth may begin to show wear. X-rays may reveal the beginning stages of bone loss. Continued progression of disease will show more serious symptoms of bad odor, inflammation, irritation, and pain. Sadly for many pets, it not until this stage that many pet parents begin to take notice. Now, it is important that your pet receive veterinary dental care IMMEDIATELY, before the situation becomes irreversible. Noticeable bone loss may appear on X-rays. In the later stages of periodontal disease, the condition is chronic and serious. Inflammation is serious and gum recession has now become extreme. Your pet may experience severe loss of bone around the tooth or teeth affected. Extraction, or the removal of teeth affected by the disease, may be necessary as the condition is now irreversible. Oral pain will be more serious and your pet may have difficulty chewing and eating solid foods. Compassionate care is required to combat pain and other symptoms interfering with quality of life. Plague triggers an immune response, whereby it is recognized by the immune system as foreign to the body and causes white blood cells to release enzymes and attack gum tissue where the foreign substance, plague, resides. Eventually, oral health problems such as weakened gums/destroyed gum tissue, bone loss, and tooth loss. This can lead to a weakened or broken jawbone. There has been a link between gum disease and heart disease, as bacteria released into the blood/circulatory system damage cardiac tissue leading to a number of problems, including endocarditis. The same bacteria can invade the liver and kidneys, causing damage to functioning of these vital organs. Schedule annual wellness and dental exams, as well as professional dental cleaning if necessary. 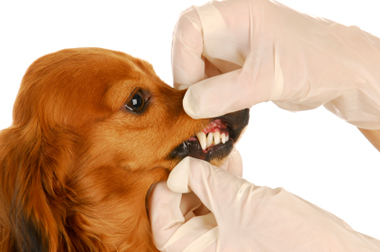 A dental exam will diagnose the condition of your pet’s teeth and gums. Your veterinarian may recommend a diet aimed at maintaining your pet’s oral health. Some pet treats can also aid in cleaning the teeth. Cleaning of the teeth and gums and the areas between the teeth may be perfumed under anesthesia, with scaling and polishing to remove build-up of plaque and tartar. An Antibiotic get may be applied to the gums. Radiographs, or X-rays, will be performed to determine the extent of the problem, as most of infection occurs below the gum line. Your veterinarian will perform an oral and dental exam on your pet during each appointment and will discuss home care and maintenance, as needed. Be sure to ask any questions you may have during this time. In conclusion, DO NOT ignore your pet’s oral and dental health. Doing so can cause pain and health conditions that worsen over time, eventually becoming irreversible.